At United Way, we are proud to strengthen communities around the world. We improve early education in Colombia, job placement in India and pathways out of poverty in Canada. Yet the way we go about our work constantly evolves—because so does society. That was a key message that the three of us shared recently at the Economic Club of Canada in Toronto. In front of corporate leaders and local community agency representatives, we wanted to demonstrate that United Way plays a vital role in creating positive community impact in today’s fast-changing world. Our session, entitled “Global and Canadian Perspectives on the Future of Corporate Philanthropy,” aimed to highlight the benefits of partnering with United Way in the pursuit of shared goals. During the session, a few big, broad themes emerged. Here are three we found most compelling. Businesses are eager to get involved. Our moderator, Rhiannon Traill, the president of the Economic Club, made it clear she hears often from business leaders who recognize the importance of community engagement for employee recruitment, retention and productivity. In a region like Toronto, that means taking the fight to poverty, inequality and lack of opportunity. It reinforced the importance of having strong corporate-philanthropic relationships tailored to the needs of modern business—and the modern worker. Embrace optimism. There is a market for an organization that empowers people and helps them come together. As Brian said, United Way brings people together to address issues that can only be addressed together. So, while the world may seem more volatile and complex than ever, there are also many opportunities and ways for individuals and institutions to work as one to create greater, positive change at scale. We should embrace this optimism and help people take action and put stronger communities at the center of all that they do. 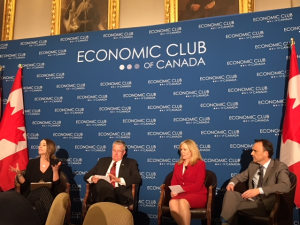 Our event at the Economic Club of Canada was a great opportunity for us—leaders from across United Way’s global network—to offer insights about today’s evolving landscape and show how we are moving forward and what platforms can empower people. When United Way works seamlessly across global, national and local levels, we are at our best. Hopefully, that’s the example we set in Toronto.